My colleague and friend, Samantha Coates, was wondering aloud on Facebook the other day just how many arpeggios there were. Not just 12 major and 12 minor arpeggios, but what if you counted all the inversions and included dominant 7ths and diminished 7ths, and all the permutations of arpeggios there might be? Sam’s original count reached 132, and she then experimented with how long it would take to play them all: 11 minutes and 30 seconds. But then the concept of articulations was raised, and then the idea of major 7ths, minor 7ths and minor-major 7ths… At which point I began to wonder if we weren’t already well over the 1000 mark in terms of all the different arpeggios there might be. First up, we’re talking 12 keys X 3 inversions (root, 1st, 2nd) X 2 qualities (major/minor – I’m leaving out augmented and diminished because they get covered in the 7th chords below) in similar motion. That’s 72. If we practice them contrary motion we’ve immediately doubled them. 144. If we practice them hands a 5th/6th apart we all of a sudden get another 72. So that’s 216. And if we practice them contrary motion, starting a 3rd/4th apart we get another 72, so that’s 288. Then we do 12 keys X 4 inversions (root, 1st, 2nd, 3rd) X 7 qualities (diminished 7th, dominant 7th, major 7th, minor-major 7th, minor 7th, half diminished, augmented 7th) X 2 motions (similar/contrary) and that adds another 672. So we’re now up to 970. If we practice each of these 7th chord arpeggios (there are 84 of them) in each inversion (4 of them) a 10th (or 9th/11th, as the case may be ) apart, then we get an additional 336. So, 1306 total so far. But wait. 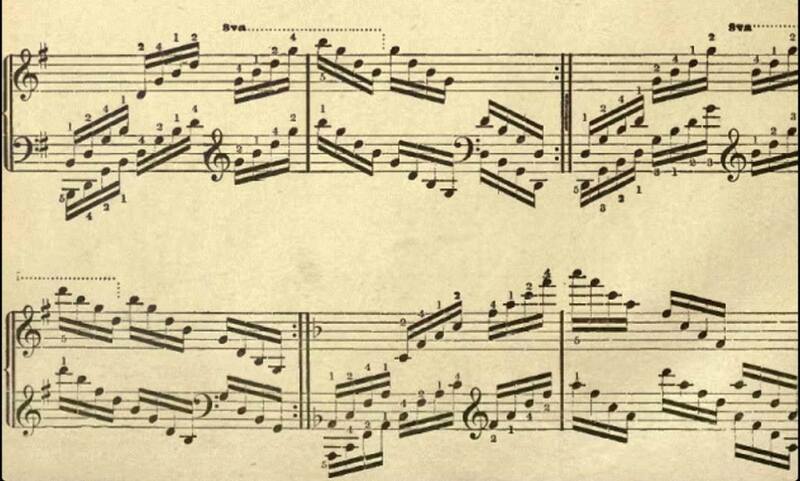 Of course: diminished arpeggios tessellate. So, in fact we need to remove from the count all the repetitions of tessellating arpeggios. That’s ALL the inversions other than root of the diminished 7ths, so we need to subtract 72. I’d love to leave it there, but what if we then practiced the 7th chord arpeggios in contrary motion starting a 3rd/2nd apart? There’s another 336 *minus* our tessellating dim 7ths (36), so that’s 1534. Of course, this is assuming that both hands are using the same articulation. If we perform the arpeggios with just four basic articulation variants: both hands legato, both hands staccato, one hand legato the other staccato, then swap which hand is which, then we end up with a total of 6136 different arpeggios to practice. So that’s 73 articulation variants times 1534 kinds of arpeggios. 111,982. And that’s before we add in rhythmic variation. Let’s conservatively estimate we have 4 of these variants we’d like students to master: LH 2 against RH 3; LH 3 against RH 2 – hands start 2 octaves apart; dotted rhythm one hand, straight rhythm the other. And let’s only apply this to the first 13 articulations listed above. That’s 4 rhythms X 13 articulations X 1534 arpeggios. 79768. Plus the 111,982. Now we reach the best calculation of them all: if it takes Sam 11 minutes and 30 seconds to play through 132 arpeggios, anyone want to figure out how long it will take to play through this million-odd? 69 days, 14 hours and 33 minutes. Without a break. Putting it another way: 41 and three quarters of 40-hour working weeks. If Sam started tomorrow she’d be knocking off at lunchtime on December 21. Sounds like time well spent. Could I put in a vote for my favourite, the major seventh with an augmented 5th? It sounds like bitonality in only four notes! Sure, there’s that major seventh with the flattened fifth, but but it’s not as much fun. And that diminished triad with the natural seventh? Leave it to Bernstein and Herrmann. I never thought about it this way – great stuff!